Hi all: I have a basic understanding of what these coordinates are, but do not know how to convert them to altitude and degrees relative to north (say using a compass and accounting for compass declination-here in NY it's 13 degrees West) for my location. Does anyone know? I have an altitude gauge (which is pretty handy) and a compass.No setting circles.There's probably a program that can do this, but I would like to understand how to do it myself. Or a textbook on Spherical Astronomy. I assume that you mean RA (right ascension), not AZ. AZ, abbreviation for azimuth, is a technical term for compass bearing. 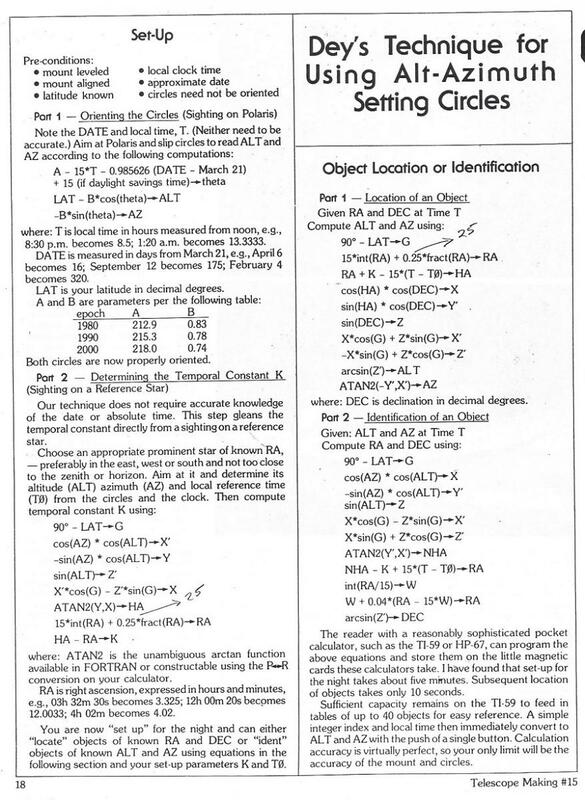 To convert RA and Dec to Alt and AZ, you also need to know the observer's latitude and the local sidereal time. This is converting between two sets of spherical coordinates, and to do that you need to know how much they are skewed (your latitude) and in what direction they are skewed (the time). If you are interested in the technical details, I can easily provide references. In practice, pretty much everybody just uses a planetarium program on a computer or an app on a tablet or smart phone, which will provide you the Alt and AZ of any object on demand. I derived that (from scratch) way back in ~1980, and it works fine! The N reference is true north, using Polaris. If you are using magnetic north, you can use that instead... but it wouldn't be as accurate. Couple errata fixed in pencil. There are LOTs of ways to skin this cat, but the imbedded math won't really be any simpler, if you are into that stuff. My equations are scalar, I would suggest using vector, provided you have vector operators available or can just write them (what I more often do). Lets see... my Az clocking is non-traditional increasing from NWSE. That's about it. I have fancier analysis that accounts for various systematic mount errors and works better than most commercial stuff, even today. The practical problem with converting Alt-Az coordinates to EQ is that an Alt-Az position never changes with respect to your viewing site, where EQ coordinates (the position in the sky relative to your viewing position) change constantly with sidereal motion. If you take an Alt-Az location for an object at, say 10 PM on a given night, and convert it to the EQ position, it's only valid for that moment. An object's EQ position is always the same RA and Dec location, but constantly varies in Alt-Az. Why convert? Why not just use your angle gauge and compass directly? I do. RA/Dec are constant. They never change. AltAz coordinates change in real time so you need a source for the numbers. There are lots of free phone apps that can provide this. Or you can print them out from other apps. This outlines the method I use when I choose not to use my computerized mounts. Works great! Note that compass North and celestial zero degrees are not the same thing. In some locations they are more than 10 degrees apart. Polaris is extremely close to celestial zero, so for all practical purposes Polaris is zero. Great thread on making an AZ gauge - examples on AltAz and Dob mounts are shown. The easiest way to convert from RA and Dec to Az and altitude is use something like Stellarium or online calculator. If you Google "equatorial to horizontal converter" you'll get lots of hits. One is http://xjubier.free....sConverter.html You can use these to convert the equatorial coordinates of a DSO to horizontal coordinates to set on a dob or other alt/az mount. You won't be nearly as lucky trying to go the other way. Going from horizontal coordinates to equatorial is more difficult. The best current book out there is Practical Astronomy with your Calculator or Spreadsheet 4th Edition by Peter Duffett-Smith and Jonathan Zwart. The book is available on Amazon in a number of formats including rental. The book has worked examples that show the needed steps to convert Alt/Az observations at a given time from a known location into equatorial RA/Dec coordinates and vice-versa. If there is any downside it is that the book’s examples build on prior ones so to understand the conversion you need to work through a number of prior examples. A balancing positive is that the book describes a number of “new” visual Basic functions for Excel or OpenOffice that aid all the needed calculations.